Amount of DNA-Feulgen staining in individual somatic nuclei and mature sperm of the parthenogenetic wasps, Habrobracon juglandis, H. serinopae, and Mormoniella vitripennis, were determined with a scanning microdensitometer. The haploid genome for both species of Habrobracon was estimated to be 0.15–0.16×10−12 g DNA, corresponding to a molecular weight of roughly 10×1010 daltons. The haploid genome of M. vitripennis is approximately twice this value, 0.33–0.34×10−12 g, or about 20×1010 daltons. 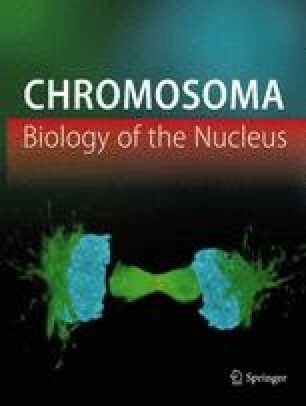 Measurements made on dividing nuclei from syncytial preblastoderm embryos of H. juglandis and M. vitripennis showed that the chromosomes of impaternate males were present in the haploid number and contained the C amount of DNA; whereas nuclei from female preblastoderm embryos contained the diploid number of chromosomes and the 2C amount of DNA. However, hemocyte and brain cell nuclei from either male or female adult wasps contained 2C and 4C amounts of DNA. Both sexes also showed equivalent levels of polyploidy (8C, 16C, or 32C) in Malpighian tubule nuclei. Therefore, in these parthenogenetic species, a mechanism must exist that compensates during later development for the initial two-fold difference in the chromatin content of somatic nuclei in haploid male and diploid female embryos. Hemocytes from impaternate Mormoniella diploid males and triploid females contain the 2C and 3C amounts of DNA, respectively. Therefore dosage compensation involves an additional cycle of DNA replication only in haploid cells, and it insures that a certain minimum quantity of DNA is received by each somatic cell.